O.k., you’re Facebooked, Twittered, social networked and mobiled. You’re into location-based services. 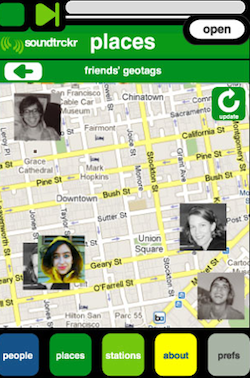 People appear on your smartphone map filled with tiny dots representing your friends like jets on radar. But you haven’t merged mobile music, social networking and geotagging into your life. Soundtrckr, a new mobile music streaming service, may be your salvation. The company’s a next-generation music streaming service blends Internet radio, social networking and location-awareness. Users create their own mobile music personal radio stations, play music with friends in real time, communicate via chat and geotag songs to places. With a fully licensed library of more than 7 million songs, Soundtrckr was founded in 2008 and began commercial service in January 2010. Unlike Pandora Internet Radio, the Soundtrckr mobile music experience is created through a mutual exchange between people. Danielle Calabrese, Soundtrckr’s CEO and President, wants you to experience mobile music to the ultimate, sharing songs and “sound tracking your life.” Unlike our past, filled with Walkmans, iPods and MP3 players, today we share location based services, such as mobile music. It’s important to our lives in real and staggered time as music streams from the Internet cloud. Services such as VodoModo and HearPlanet deliver streaming video, one of the fastest-growing mobile services. Soundrckr is plain vanilla audio laced with the emotions that only music generates in our minds and hearts. Mobile music is about discovery, delivering the right song to the right person using filters. Friends suggest music based on location and mind-set. It’s not a top 40 playlist; rather, it’s music that exists in our heads and hearts, drawn from a lifetime of experiences. In the podcast, Danielle paints a picture of his dream for the company and how Soundtrckr integrates mobile music, social networks and geotagging technology. 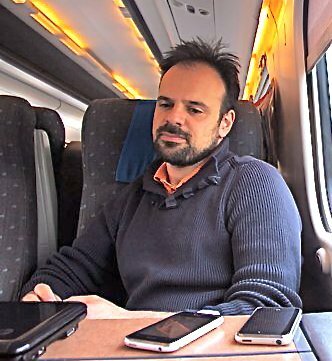 Daniele Calabrese, Founder & CEO of Soundtrckr, is the former Communications Officer with the Development Communications Division of the World Bank, where he focused on wireless technology, infrastructure, telecom, energy, public sector reform and climate change. During his tenure Daniele initiated the First World Congress on Communication for Development, and spearheaded numerous international communications efforts involving mobile technologies. He holds an MA in International Affairs from George Washington University and a Political Science degree from Istituto Universitario Orientale in Naples, Italy.